According to a recent survey, 17% of millennials expect an annual promotion, and 40% have voiced a desire to serve in a leadership capacity. 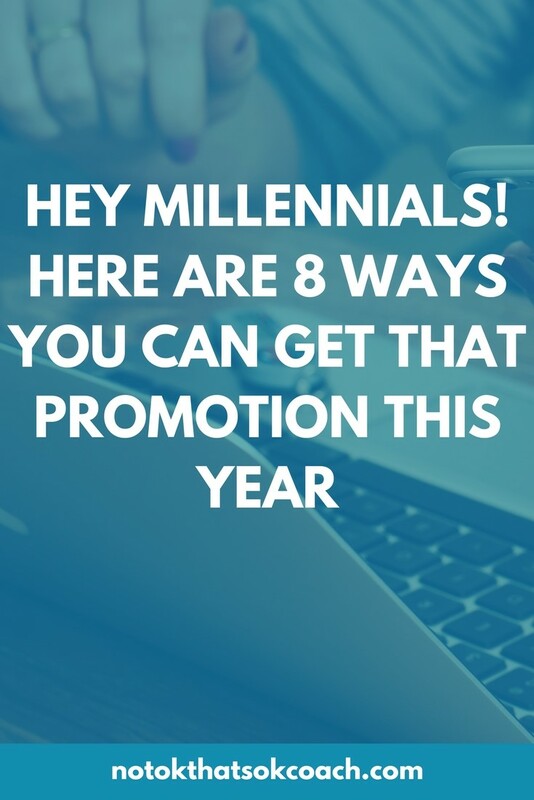 However, many millennials are unsure of how to stand out, get noticed and make productive changes towards career advancement. The beginning of the year is the perfect time to invest in yourself and create a plan to land a promotion and take your career to the next level. These eight focus areas will put you one step ahead and set you apart from your competition. Make it a priority to schedule consistent meetings with your boss. During these sessions you can ask for feedback, and get a constant gauge on their expectations, areas to improve on and more importantly how you’re making a positive impact in the organization. If your job doesn’t have a system for feedback already in place, start with bi-weekly scheduled check-ins to ensure you’re getting undivided attention. Ongoing learning is essential to advance your career and it doesn’t have to cost you or your organization thousands of dollars. According to Kevin O’Connell, Founder of The Niche Movement, “visit Eventbrite or Meetup. There are hundreds of free or five-dollar events every evening in your city that you can attend.” If you’re strapped for time outside of the office, think about what you can do while you’re there. O’Donnell suggests, “inviting someone interesting, within your organization or someone in a different industry out to coffee.” This gives you the chance to ask questions of someone with a different skill set and build relationships along the way. Take 30 minutes each month and update your resume. Often, when applying for a promotion you’re asked to provide a resume and it’s hard to remember everything you’ve done at your organization. By keeping it current, you’ll always be ready to put your name in for the next big opportunity. If your company has a clear path for promotion, look at the job description for the position above yours and see what experiences you’re missing. Look for assignments or projects in those areas to take on. If your company doesn’t have a clear path, speak with your supervisor about projects that they are aware of that will enhance your skillset and would be valuable for both your success as well as the company. Getting to know the people who work with, for and around you is essential when looking to advance your career. According to John Lim, entrepreneur and host of the Moving Forward podcast, “a network is all about investing in relationships, not connections or business cards. If you’ve cultivated relationships by providing value and supported them in their goals and endeavors, those in your network will be naturally invested in your success.” These individuals will in turn think about you as an additional asset to the organization because they have seen you in action personally and professional and know that you have the best interest of the employees and company in mind. According to Becky Hammond, Founder of Isogo, “millennials have both the mindset and the opportunity to position themselves for fulfilling success, and your strengths offer you a shortcut. Your strengths give you tools to build a diorama that is unique to you and helpful to your organization. No one around you can bring to the table what you bring.” Hammond continues, “when you offer something unique, above and beyond your role, you will be noticed. Your strengths identify not only the value you bring, but even more importantly, they give you clues as to what you need in your environments to truly show up and shine.” The key is to look for opportunities where those needs are not being met, and use your strengths to fill in the gaps. This will help you stand out, get noticed, and advance your career. If you haven’t already, now is the time to start keeping tracks of your wins- big or small. Did you get a positive email from a client? Did you solve a problem for your organization? Create a space to keep your positive feedback and successes and have them always ready to share with your supervisor. You never know when the opportunity for a promotion may come up and you want to make sure you are easily able to share how you made an impact on the company.